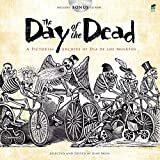 The holiday begins on October 31st and ends on November 2nd, and we're happy to present these samples from the Dover collection of ~ Dia de los Muertos ~ Pictorial Archives, Adult Coloring Books, Iron-On Transfer Patterns, Stained Glass and more! Pages are perforated and printed on one side only for easy removal and display. Specially designed for experienced colorists, Day of the Dead and other Creative Haven® adult coloring books offer an escape to a world of inspiration and artistic fulfillment. Observed on November 2, the Day of the Dead offers the living a chance to remember and honor their departed friends and family. These 16 illustrations commemorate the Mexican holiday with scenes inspired by papel picado, a folk art involving paper-cutting, and the artistry of cartoonist José Guadalupe Posada. Includes bilingual text. Artfully and accurately rendered in the tradition of Mexico's Day of the Dead, this set of whimsical, vividly costumed skeleton figures honors the memory of the departed. The unique bilingual collection features two paper dolls, fifteen ornate costumes, a variety of altar offerings, and a bonus sticker poster.